Tweet One of the best albums in 2011 comes from a band called Dead Sara. The band is fronted by the powerful voice of Emily Armstrong. With a debut album dropping next month and a current tour with Bush, Dead Sara is hitting on all cylinders. Emily recently stopped by to discuss the band, their sound and her early influences. Q – Where did the name Dead Sara come from? A - It comes from a Fleetwood Mac song "Sara" where in it she says, "Said Sara," or "That’s Sara" but Sioux and I liked it as, "Dead Sara" and later decided it as our name. Q – I love the debut album. It’s a breath of fresh air from what’s currently out there. This is easily one of the best albums in 2011. Did you realize you had a great album when it was finished? Were there things you wanted to change afterward? A - Thank you! Well, it was all kind of a fast process so it didn't really give us room to critique it as much. From the writing of the record to the recording we liked everything we were doing and having it be our first record, it’s something special to all of us. So no, I wouldn't want to change a thing. Q - What was the writing and recording process like? Does one person do the majority of the writing or is it a collaborative process? A – It’s more a collaborative effort. Most of the writing is in the rehearsal room with a riff or some sort and we go on from there - when everyone feels it and starts playing along. Later we'll take the parts we like and make it a song. When recording, we just like to have it as live as possible. A raw sound. 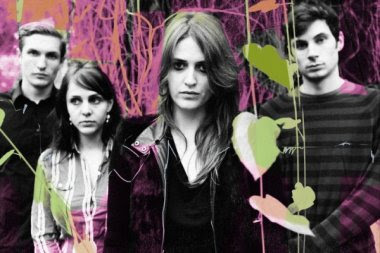 Q – Dead Sara’s sound mixes classic rock, pop and blues. How would you describe the band’s sound? A - We have lots of influences. It’s hard to describe it really. We end up just telling people when they ask, that it’s Rock. Q – The first single is “Weatherman.” How do you determine which single is released first? A - We were having a hard time with that actually, until the radio station program director Mike at The Rock 106.9 WCCC in Hartford, CT started playing it. He basically chose our single! Thanks Mike! Q – What has been the reaction of the album thus far? A – It’s been good! All positive. I’m just excited for it to be released October 11th and for more people to listen to it! Q – The band is on tour with Bush. How did this tour come about? A - I believe it was their managers that were at a show of ours and so when Bush asked for a female fronted rock band to maybe open up for them we were mentioned. Q – Who were your influences growing up and which one had the greatest impact on you as a musician? A – That’s a tough one and a really long list I could give you! It’s all over the board. But I remember Fleetwood Mac and Led Zeppelin being the two bands that completely opened up the doors for me as far as inspiration goes at a very young age. A - Not really. Thanks for having our band on your site!